George Michael, Phil Collins, Sting, Whitney Houston, S Club 7, and Des O Connor. Every show should of course have plenty of Des! ENJOYS MOST ABOUT HRB: Providing a worthwhile and memorable service for the patients and staff, meeting a variety of different characters during my ward rounds and making close friends with many members over the years. BEST HRB MOMENT 1984 – The first year of HRB – the station worked so well together as a team. 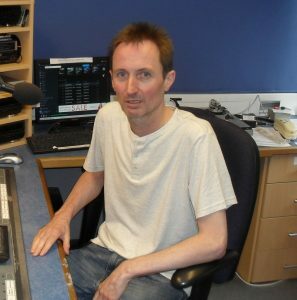 OTHER RADIO EXPERIENCE Reporting and producing sport on both BBC and independent local radio, and being part of Basingstoke Carnival Radio and Kestrel FM when they were run as short term stations in the early nineties.